The information age has given us plenty to be grateful for. We have more access to information, to people, to education. Our technology is moving so fast that it’s possible for anyone to start a business, learn a new language, and meet new people everywhere we go; even without leaving the house! But everything has its downside. Not leaving the house isn’t all it’s cracked up to be, especially when it comes to the health of your family. Current research suggests the average child spends more than 2 hours a day in front of a screen: at home, at school, and on the go. The excessive screen time has been linked to an increase of depression and social isolation, short attention span, and obesity, leading to a host of health issues like diabetes and heart conditions later in life. So how do we get kids outside for some adventure and fresh air? Why not use some of these tried-and-true activities to get kids learning something hands-on, instead of working from a screen. It’ll spark imagination and curiosity, encourage fresh air, and they’ll be amazed to learn something without the help of the internet! Ashley at Practical Self-Reliance is a self-described homebody. She knows no matter how much time you spend at home, you should never feel cooped up! Her blog is full of projects that get the whole family involved in self-reliance and sustainability, as well as being educational. Her mushroom garden growing tips include insights on which mushrooms are easiest to grow, how to prevent little ones from sticking unsafe mushrooms in their mouths, and even which fungi thrive best in your favorite compost! It’s a fun and easy way to get kids of all ages learning about gardening, and growing their own food. Ellen at In Our Spare Time is a big fan of getting kids out and about. She believes kids are natural at following the quick movements of colorful butterflies. So encourage that curiosity with her tips on butterfly hunting! Ellen’s post talks about how to introduce kids to different varieties of butterflies, get them outside to gain some first-hand experience, and even how to help your local butterfly conservation efforts. Paper Heart Family describes itself as a resource for moms, but we think it’s much more than that. Brenda has excellent tips to get the kids out of the house. The best part of this one is that you can use whatever you have on hand, and set different obstacles depending on the age of your kids. Embrace the snow day and get outside! Speaking of snow days, Kirsten at Comfortably Domestic usually specializes in delicious made-from-scratch healthy foods that are kid-friendly. But she’s also got a great idea for an out-of-the-house art project for your favorite little artists who are feeling cooped up this winter. 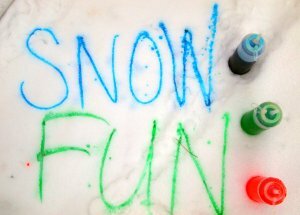 All you need is some food coloring, and a fresh patch of white canvas- er, snow. Mom Advice is a great site for creative crafts and projects that spark creativity and encourage ingenuity in your kids. Take a look at their pen pal project to get kids away from email and into good old-fashioned letter writing. It’s an excellent opportunity to learn about new places and meet new people. Or, Bubblesnakes! Give their bubble recipe a whirl and try your hand at making colorful bubble snakes! Kids will spend hours mixing their own bubble mixture and creating beautiful, lasting bubbles with just a few household items. Julie at Jules and Co believes you can instill an interest in nature early with this sensory tray. It’s just a matter of taking your toddler around the yard and finding all the interesting natural textures for your toddler to feel and explore. It’s sure to encourage a love of the natural world that’ll keep your little one exploring the outside world, instead of just looking at it through a screen. Dedicated foodie Diane Johnson and her husband Eric have printables for fun outdoor crafts and activities, as well as delicious fresh meal ideas! Try her nature scavenger hunt, which includes pictures to make it easy for even your youngest adventurers to play along for hours of backyard fun! Sam is an expert in crafts, with years of teaching crafters to create a home business following their passion. She’s also a mother, and like most of us, she loves encouraging creativity in her little one – but hates the mess! Check out her mess-proof outdoor painting solution for artists of any age. Aileen at Aileen Cooks is all about food and making great memories with your family. This mom of three is full of ideas to keep kids busy and happy! If you’ve got a kid who’s crazy about cars, and you need to encourage some creative play, her idea of using cars to paint is sure to keep little hands happy. The best part is, it’s easy to clean up! Alternatively, Aileen suggests an Outdoor Obstacle Course. A great summer option for a day outside and all you need is some outdoor equipment and sidewalk chalk. Don’t let the weather keep you indoors! Andrew and Larisha at We’re Parents are all about natural parenting. They’ve compiled a whole list of puddle-friendly activities to keep kids outside even when the weather refuses to co-operate! From splashing, to tag, to playing something together as a family, you’re sure to find something fun to do. Parenting Expert To Mom is a thriving community specializing in child development from infancy to three years. If you’re looking for ways to get your baby more familiar with nature, these great learning activities with leaves are the perfect starting point. Read on to find out how to help baby learn shapes, colors and more! Marci at My Heavenly Recipes has been making play dough at home for years. And she’s perfected this recipe just like she’s perfected all her more edible recipes… on her kids! Homemade play dough is bound to be a hit for kids of all ages, and they’ll love helping out in the kitchen too! If you’re handy with some tools, and you need to replace your tires, Angi at Schneider Peeps has a great family project. A tire swing is fun for the whole family, and offers a great way to entice the kids outside for some fun. To make sure her kids stay in the real world and not watching endless hours of cartoons or playing video games, Rachel Bustin has a simple rule you can also enforce at home – no screens in the bedroom. She’s always encouraged that the bedroom is for sleeping, not for games. This way, you keep an eye on what your children are watching, which is really important considering what there is out there online. Rachel and her husband also try to lead by example by putting their phones/screens down as well. At the weekends, make the effort to get outside to the park or go for a walk and limit screen time. I use “myself” to get the kids off the screen and out. I act like what we’re about to do is so exciting with a sense of urgency in my voice. I don’t tell them what we’re about to do (I usually don’t know myself, I just make it up on the fly) and to hurry up and get dressed. Because of my excitement and urgency, they have no problem putting the phone or tablet down. We usually play catch, race, blow bubbles, ride bikes, etc. Once we’re outside it’s easy to find things to do, it’s just getting out them out there that I have to act a little “extra”. These days, encouraging kids away from their screens can seem a daunting task. Between school work, video games, and social media, there’s plenty to keep kids of all ages occupied indoors. To keep your family healthy and active, make use of some (or all) of these activities. From the creative, to the educational, to the adventurous, you’re sure to find something your family will love, to keep them in the fresh air, and away from their screens for at least a few minutes! SO many great ideas for unplugged fun! My boys would love to paint with cars, and they’re always up for playing new games in the rain. What a great round up!